It seems like ages since chocolate chip cookie dough ice cream was all the rage which, in essence, makes these cupcakes retro. And these days, retro is all the rage. In fact, the Baked bakery guys are set to release a whole cookbook devoted to twists on the classics. So yes. The chocolate chip cookie dough dessert is back. And it’s back even better in this cupcake. If you remember last week, I mentioned that I’m working my to-make cupcake list to the bone for the upcoming Cupcake Camp New Haven. It’s gonna be a busy August. But when cupcakes like this one come out of my kitchen, nobody is complaining. Especially not a group of fabulous food bloggers who were on the taste-testing end of this cupcake trial at Big Summer Potluck this weekend. This event deserves it’s own post which will come later in the week so for now we’ll keep the cupcake front and center. I was incredibly pleased with how these sweet little things went over with the group and even more pleased with how I thought they tasted. 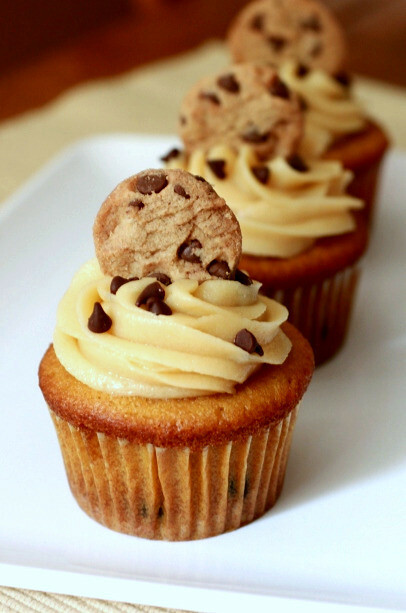 Holy cookie dough cupcake! The icing was a complete dead-ringer for the flavor of cookie dough and the hidden cookie dough surprise in the center of the cupcake made this cupcake. I’m happy to report that I didn’t use all of the filling for the cupcakes so I rolled the filling into little balls and frozen them for cookie dough ice cream at a later point in time. Because, you know, in this house, cookie dough ice cream will never go out of style. Preheat the oven to 350° F. Line two cupcake pans with paper liners (24 total). In the bowl of a stand mixer fitted with the paddle attachment, combine the butter and brown sugar. Beat together on medium-high speed until light and fluffy, about 3 minutes. Mix in the eggs one at a time, beating well after each addition and scraping down the sides of the bowl as needed. Combine the butter and sugar in a mixing bowl and cream on medium-high speed until light and fluffy, about 2 minutes. Beat in the flour, sweetened condensed milk and vanilla until incorporated and smooth. Stir in the chocolate chips. Cover with plastic wrap and refrigerate until the mixture has firmed up a bit, about an hour. Cut a cone-shaped portion out of the center of each cupcake. Fill each hole with a chunk of the chilled cookie dough mixture. Beat together the butter and brown sugar in the bowl of a stand mixer fitted with the paddle attachment until creamy. Mix in the confectioners’ sugar until smooth. Beat in the flour and salt. Mix in the milk and vanilla extract until smooth and well blended. Tara, how did I possibly miss these on the table at Big Summer Potluck? I made these recently and they were SUCH A hit! Looking good! Oh hecks of a yes! These look delicious! I’m so thrilled I got to taste these! They were the highlight on a very crowded dessert table. Thanks! Lovely blog and beautiful cupcakes! I’m glad I found you. Oh cookie dough – it will always be the rage in our world considering it’s completely impossible to resist and completely delicious. These cupcakes are gorgeous and look awesome! Tara, these are absolutely stunning! PRETTY!!! I made these using a chocolate cupcake and they are fabulous! By far the most popular dessert I have ever made! These sounds absolutely phenomenal! I would love to take a big bite into one of these little babies! I love the idea of a “cookie dough” surprise in the middle! These cupcakes look awesome and the frosting looks so yummy! Never underestimate the power of a good tagline…I’m sold. I’ll have to add these to the “must make” list. I found these on another website and just made them last night. While I LOOOOOVED them, others thought the frosting was a little too sweet. I’d use less sugar next time. I didn’t eat one while at the BSP, but Pam shot me a look as we were readying to leave that said, “Take this food out of my house, Amber, or it’s going to end up on my hips” – always eager to take one for the team, I grabbed one of these and added it the plate of goodies I was taking home. I ate it yesterday as an afternoon snack, and was totally psyched for this post. I could not figure out how it tasted JUST like cookie dough! The next time I go back to Texas, I’m making these for the niece and nephew. They will love love love them. So beautiful, I wish I had grabbed one…oh well that gives me the excuse to make them…I am sure my kids will thank you!! Nice meeting you last weekend!! Yes, your kids will love them! It was so nice meeting you too – and we need that crab cake recipe! Is it on your blog? They were so darling just like you! How insanely delicious these look! If this is the trend of the future then I’m loving it. I was just talking to someone about how cookie dough, cake batter and frosting were my favourite indulgences, forget the actual cake or cupcake. Now these on the other hand look like I would devour the whole thing!! Those were seriously one of the most amazing cupcakes I had ever had. That frosting… OMG…that frosting! awww thanks Kristen! I know…i think it could make a meal off of the frosting alone. It was so great meeting you too and I hope to keep in touch – here’s to hoping BSP happens again!! PS – I’m totally in love with your blog and photography!! There is nothing better than cookie dough frosting! Holy cow. These looks AMAZING! Cookie dough ice cream used to be my absolute fave, and will always have a special place in my heart. So you know these are getting made soon =P. Thanks for sharing something so, so fabulous. Oh heavens…theses are delightful. And they look amazing! yum! i’ve been looking for a fun treat to make my nephews before they head back to school- this might be it!! OMG these look amazing!! Can’t wait to try them!!! Thanks for sharing. What a creative cupcake! I love the chocolate chip idea. Great job!!! These are sooo good! One quick question though! Do the finished product have to be refridgerated?? I’m making them right now and wanted to know so I dont make anyone sick!! Thanks!! Stephanie: No, they don’t. You should be fine keeping them at room temperature for a couple of days depending on the temperature. Just try to keep them in a cool area. Enjoy!! I made these for Christmas dinner and they are even better than they look…and they look amazing. Thank you so much for sharing this. did not like. tasted a little too bland. Amanda: No need to refrigerate unless it’s crazy hot in your house; the butter in the frosting will soften in the heat.